Melloy Dodge: The 2014 Ram ProMaster™, A Work Van You Can Depend On! 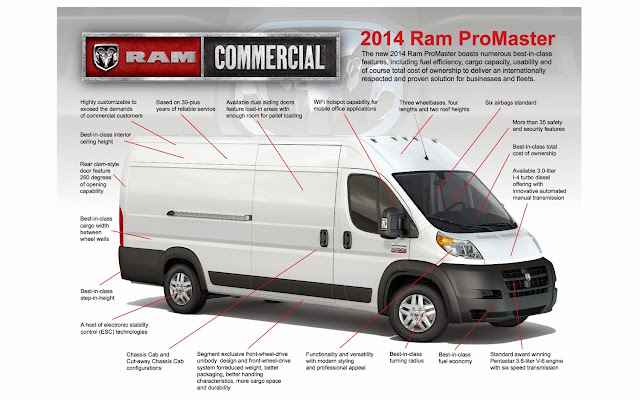 The 2014 Ram ProMaster™, A Work Van You Can Depend On! This game-changing van, which has already arrived at Melloy Dodge, with a starting price of $28,630, is propelled by either a gasoline-powered 3.6-liter Pentastar six-cylinder (280 horsepower and 260 pound-feet of torque) which will give you power without sacrificing efficiency, or a new incredibly efficient turbocharged 3.0-liter four-cylinder diesel (174 horsepower and 295 pound-feet of torque) which boasts 18,500-mile max interval between oil changes. Both engines are extremely powerful and exceptionally efficient. The 2014 Ram ProMaster™ gets the job done on any site! New Mexico’s weather and conditions can prove to be an extra challenge on many jobs. Thankfully, the ProMaster™ has all of the power, durability, and efficiency you could need for any situation good ol’ NM can throw at you. It has outstanding cargo capacity that tops out at 530 cubic feet. But it also has the payload to handle loading it up: Best-in-Class cargo van payload+ up to 4,400 pounds. A maximum towing capacity+ of 5,100 pounds adds even more versatility. But, thanks to two efficient powertrains to choose from, all that capability doesn’t compromise efficiency. A forklift can load a standard pallet through all cargo doors, including the 49-inch-wide side door opening. The rear doors open up 260 degrees and lock in place. And the headlamps are raised to keep them out of common collision zones. All of the amazing features included in this new work van will help you and your business minimize downtime, giving you more time to get the job done. That’s why the Ram ProMaster™ was tested in severe climates and built on a platform proven over 30 years. In a work vehicle, uptime and cost of operation are even more important, because in business time is money, and if your vehicle isn’t working, neither are you. The three-piece modular front fascia was designed specifically to simplify service and reduce repair costs, keeping the van on the road longer and with a lower total cost of ownership. Other available features such as the hands-free Uconnect® system features a 5-inch touchscreen to handle available navigation, Bluetooth® and entertainment options are the icing on the cake for the Ram ProMaster™. Overall the Ram ProMaster™ offers strength, durability, reliability, technology, and peace of mind, knowing you’ll be able to get the job done. Melloy Dodge can help you get into a Ram ProMaster™ so you can see just how hard this vehicle can work for you.